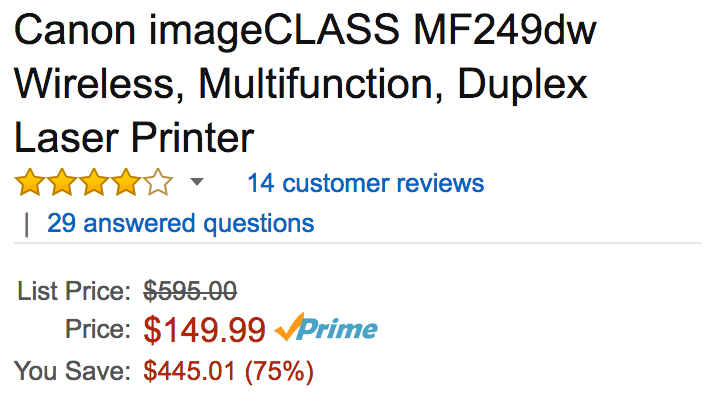 Amazon offers the Canon imageCLASS MF249dw Wireless All-in-One AirPrint Laser Printer for $149.99 shipped. It has a list price of $150, but usually sells for around $210 or more at online retailers like B&H. Today’s deal is an Amazon all-time low. With tax season just around the corner, investing in a powerful all-in-one printer like this one from Canon isn’t a bad idea. It can print, scan, copy and more plus it has AirPrint capabilities for Mac and iOS users. You can count on speeds up to 28 pages per minute. Rated 4.1/5 stars. The all-in-one, Canon imageCLASS MF249dw laser printer offers high quality output, feature-rich capabilities and reliability that is ideal for any small office or home office environment. The imageCLASS MF249dw has print, scan, copy and fax capabilities so you can accomplish all necessary tasks with just one machine. With many easy to use features such as the intuitive touch LCD panel and various mobile solutions, your daily workflow will be a breeze.